Samuel Kerr (KR): It is a pleasure to be able to interview you. I’ve never mentioned it, but we have much in common besides the love of choral singing. You studied medicine, and for ten years I conducted the student choir at the Santa Casa School of Medicine of São Paulo; you wrote an excellent book, “A choir in each classroom”, and I had an article published in a didactic magazine in my university entitled “A choir in each school”; you were a singer before becoming a conductor, and I sang the Evangelist in pre-Bach passions and participated in quartets, one of them called “Mestres Cantores”; like you, I have been involved in musical education proclaiming “to the four winds” “never say to a child that he or she is singing out of tune”. We are both arrangers. I cannot call myself a composer, though I had some approaches to what I like to call “choral invention”. The subtitle of the Mass alludes to a time of peace. Speak a bit, or a lot – about the importance of choral singing in this world confused as to our place in it; the need for peace among nations, the problem of sound pollution, the attention we need to give to matters of ecology; how the human voice can, while singing, make communities think about these issues. In Brazil choirs do not sing in religious services any more. I do not know much about the state of sacred music in Argentina, but tell us about it and perhaps, give us a glance of what is going on in Latin America in general. 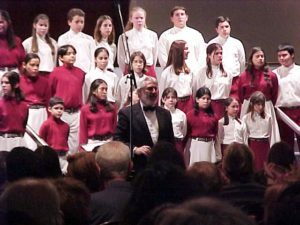 You conducted Misa Criolla in its 40th anniversary, written at a time people of the churches were called to sing in their own languages, according to their traditions, but rejected choral liturgies. Misa Criolla still continues to thrill, but what other choral works have appeared since to meet the recommendations of the Concilio Vaticano? It is great to know about your Minimal Mass! Oscar Escalda (OE): Before I answer your questions, allow me to tell you that when I first met you in person, I had the feeling that I knew you from a long time ago. I remember the first email that you sent me asking me what might be a good program for the “community singing workshop” for America Cantat VI that we did in Brazil. I was touched with happiness by the way in which you accepted my answer though all I told you was that you should feel free to make attendees enjoy choral singing away from structures and let them “play with the music”. Indeed, we enjoyed enormously the results of your work that was far beyond our expectations. As for my concern about peace, there has always been a dilemma in me as to how choral music might help to achieve this goal. In my opinion, peace can be achieved when we learn to accept the differences that we share with others. This has been thought of and written about by great poets and writers throughout the centuries; therefore there is not much to add. The problem is how to express it through music. I tried to do it through Canto Latino, which is based on twenty of the most famous Latin American popular tunes in a form of a quodlibet, that served me as a symbol of peaceful coexistence. In it, melodies must adapt themselves to each other, but without losing their identity, flavor and beauty, to enable the construction of something bigger altogether. Then, while I was reading Canto General by Pablo Neruda I found “Peace for the twilights that come” that seemed to me like a prayer in the way that Incas prayed to their God the Sun: in a direct way, like our children speak with us, almost on the same level, and that inspired me to write the Minimal Mass with his poem providing the words. In Argentina the churches don’t have choirs either but many of their priests offer the space to allow choirs to perform in them. After Concilio Vatican II, some other masses were written in Argentina besides Misa Criolla, like the Mass of the Third World with lyrics by Father Mujica and music by Roberto Lar. Like Monseñor Romero in San Salvador, Father Mujica dedicated his life to preserving human rights, particularly among the poor, and like Monseñor Romero, he was assassinated in his church. Yes, I had the honour of conducting Misa Criolla on the occasion of its 40th anniversary with Ariel Ramirez himself at the piano, among other great artists. The municipality of Buenos Aires promoted the event, which was attended by more than eight thousand people sitting on the grass or on improvised chairs at the Park Thaïs in Buenos Aires. A standing ovation was the gift of these people to Ariel Ramirez, and to the most popular mass. It was very touching for this man, by now in his late eighties, to receive the love of such an audience. Among other things, choral singing is a good tool in the fight against drug addiction. There are investigations showing that drug addiction is 70% less common in people who sing in choirs than in those who do not sing. There are also special programs to take away young people from drug and alcohol addiction that include daily choral practice to help them leave that situation. SK: Now a question to the cultural animator, one of the leaders of America Cantat! Extending the choral issue beyond the churches, how would you describe, in words, the choral sound in Latin America? Is it possible to identify a distinct sound, different from European or United States’ choirs? Is there any special characteristic? Are there diverse ways of training? Special ways of vocal production? What have you observed throughout the six editions of America Cantat? OE: Once I asked a German director why he invited me so many times to give seminars in his school of music. He told me that he found Latin- American conductors always show a great freedom in the performance of music of any kind. In almost every language “to play” is the meaning of making music: “spielen”, “jouer”, etc, and in Spanish and Italian that concept is included in the word “preludio” that comes from Latin “pre”- before- and “ludus”- to play. We can find an example of “just playing” when the style of the tango was changed during WW2: musicians enjoyed themselves playing tango as a military march! And that is how the ”marcato” style appeared in the 40s. I think that this freedom is the characteristic of Latin-American musicians. SK: Recalling America Cantat 6 – that’s where I heard your composition Tangueando. I was very much interested in it and asked you for a copy of the score that I then included in a program I presented conducting the Youth Choir of the State of São Paulo last year. It was a success! Only then did I discover that this work had already been a success in 2001 and was already considered a “bestseller”! Tell us about that success in your career as a composer. OE: Tangueando is quite a unique work. I composed it around 1977, but in spite of introducing it to some friends, choral conductors, I never got them to include it in their repertoire. I guess it looked to them very strange, due to it being a minimalist work. Finally the University Choir of Mendoza premiered it in 1990. Then, in 1994, I went to the USA invited by ACDA to give a lecture about Latin-American music, and I brought it with me. When I returned to Argentina I found some letters inviting me to publish it. I asked some colleagues who recommended I accept Lawson-Gould’s invitation because they published the arrangements of Alice Parker and Robert Shaw. The first great surprise was that it was included in the songbook of the Vancouver World Symposium. 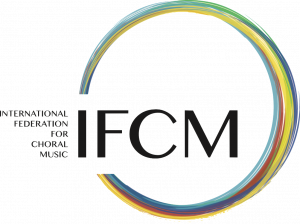 Then the IFCM selected it to be one of sixteen pieces published and recorded in the series “Cantemus”, and the World Youth Choir recorded it. Some time later, the Philippine Madrigal Singers conducted by Andrea Veneracion included it in the repertoire with which they won the competition in Tolosa, Spain, and since then it has become more and more known up to the moment when it was a bestseller in the catalogues of Warner/Chappell of 2000 and 2001. Unbelievable! To think that it was in a box for more than ten years and nobody performed it, not even my friends! Really, Tangueando is part of the “Suite of Buenos Aires” (Suíte porteña) together with Mudanzas, Candomblé and Milonguera. The Gloria of the Minimal Mass also employs minimalist technique, for double choir. SK: And for the arranger: How does your activity as an arranger work? Do your choirs select the songs? Or is it the composer who drives the arranger (I consider arranging a way of composing). Tell us a bit, or a lot!! OE: Like many arrangers, I have some composers that I particularly like to arrange. One of them is Astor Piazzolla. I think that such beautiful music must not be absent from the repertoire of choirs, and they also deserve the pleasure of performing it. Among others, I made the arrangements of his “Four Seasons of Buenos Aires”, Piazzolla’s offering to Buenos Aires as well as a homage to Vivaldi. I think that the duty of an arranger is to offer an accurate version of the idea that originally inspired the composer. If he or she can improve that idea, s/he will be adding soul to it, and that will be a nice way of allowing more people to enjoy what originally was not there. Sometimes the choir suggests to me some particular piece for arranging they would like to sing. Of course, I consider such ideas and if I can adapt the piece for the choir, I do. SK: Now speaking to the editor: how much demand is there from choirs for published works? How are editions affected by the new media like the internet, the xerox machine … Is it possible to have new composers, new arrangers? OE: Unfortunately, I think publishers will gradually have to change their way of working because of photocopying and the possibility of downloading written music from the internet. If people photocopy the originals, is because of the low cost of photocopies. Therefore, publishers should find a way to reduce costs in order to reduce the interest in copies instead of people buying the originals. There are some publishers who have tried several ways of using the internet, but we have not yet found a way that can be successful for everybody. However, this is perhaps the best time for composers and arrangers as business is increasing with new publishers. I’m sure that publishers will eventually manage to find a way of using the internet to combine profit with letting choirs buy the music at a very low cost. 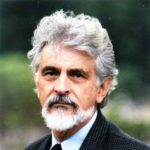 We shouldn’t forget that the internet has turned out to be a great democratic tool, and it is quite possible that each composer can be his or her own publisher. This tendency has already started. We shall see how it manages the next steps like distribution, advertising, etc. SK: This is a question for the educator: your excellent book “A choir in each classroom” offers precious material to the teacher and reveals a knowledge of children’s voices, but I would like to ask you also as the conductor, composer and leader of choral singing, how the influence of TV and the internet has affected the musical interests of children and how it has affected their voices and how it might be possible to link traditional repertory with the new sounds that are surrounding children’s early years? Which works might result from this moment of significant transformations? OE: I don’t know much about how the internet or TV can influence children’s musical lives. What I do know is what teachers can do to them. I tell in my book how once we were with my family on Christmas Eve and my nephew asked me to teach them to sing something. So I improvised a very simple quodlibet and had everybody sing it. At the end of this experience my mother came to me saying: “It is unbelievable how you managed to make me sing!” “Oh! Mother”, I said, “it was a very easy song. Everybody can sing it”. “Oh no!”, she replied. ” When I was at school, the teacher told me that I could not sing in the choir because I did not know how to sing, and I believed her”. From that moment my mother had never sung again. Unfortunately teachers like that give this answer more often than one can imagine, and I think that it is far worse than any damage the internet might do. From that moment, I promised myself that I was going to focus all my energy on eliminating that erroneous thought from the minds of music teachers. When I was conducting the Children’s Choir of the Teatro Argentino, we developed a plan in order to arouse the children’s interest in coming to the theatre through the possibility of having children on stage acting, singing and dancing. So we started with Lewis Carroll’s Alice in Wonderland, and I wrote a musical called Las desventuras de Alicia en el Pais de las Maravillas, with the children’s choir as the principal. We succeeded in our goal, as it was performed more than 36 times, and more than 40,000 children attended the theatre. Currently it is being produced in a number of schools in its version with piano. After this experience we wanted to upgrade our efforts one more step, so we thought of an opera for children. That is why I wrote Sancho Panza’s Great Box of Treasured Memories, the story of Don Quixote told by old Sancho to a group of children of his town. I composed it for children’s choir, soloists, puppets, children’s ballet and orchestra. We did more than 20 presentations during the seasons of 1997 and 1998 with the hall sold out. Then it was performed several times in other theatres in Argentina and in France. I am telling you this because in my experience I subscribe to what was said by Orff, Kodály and other great musical educators when they say that children come to music from what they understand, from their own musical tradition which is what surrounds them in their daily lives. SK: A request to the director: Coral del Nuevo Mundo (New World’s Chorale) has a name that reminds me of the Hesperides, imaginary islands in the Atlantic where ancient people said that there were trees with golden fruits, probably the actual Canary Islands. Hesperides’ Chorale, golden fruits cultivated by Latin-American voices! Tell us about your emotions conducting your singers of the New World. Tell us how you managed to make them sound like the music of the Americas of the 17th century, the golden fruits of Hesperides, the New World! OE: What a lovely portrait you paint us of the Hesperides! I think that you are right, the New World still has a large number of golden fruits to offer to the Old World. That is why in 1996 we named this choir Coral del Nuevo Mundo. The Americas offer enough quantity and quality in order to enable any choir to specialize in its composers and arrangers. In 2000, during the Jubilee [a rare Roman Catholic feast during which the faithful receive the Pope’s blessing, and all their sins are forgiven – translator, after consultation with the author], we were invited to St. Peter’s in the Vatican to sing one of the masses scheduled in languages other than Latin, and Misa Criolla was one of them. But this is not the point. The interesting thing about that invitation was that somebody thought that the Misa Criolla was good enough to be included in such a high profile event in the Vatican. The three CDs that the choir recorded are all of Latin-American Music and include the Misa Criolla. Incredibly, Asia is full of choirs and orchestras that love Latin-American music. I can say this because the sales of the Latin-American Music series published by Neil A. Kjos, Music Publishers, are very good in those countries. SK: But we do not always remember the golden fruits of our trees. We are very much looking across the Atlantic, waiting for imported fruits. 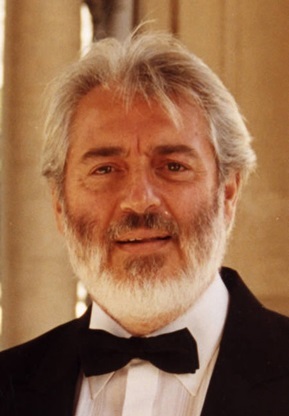 Through all those experiences as singer, conductor, arranger, composer, professor and leader of Latin-American choral music, what would you recommend to music students, and what is the “sound panorama” that future conductors will find for them, from our tree of golden fruits, of which the ancient people of the European continent dreamed? OE: Yes, you are right. There is very little respect for our golden fruits. Let me remind you that in 1983 Argentina left behind military rule and started to walk the path of democracy. Starting in 1987 I did some research under the title of “National Identity in Non-Systematic Musical Education” that was presented at the Argentinian Conference for Music with the support of UNESCO. Within those three years I analyzed the entire programs of the institutions dedicated to classical music: national and provincial orchestras and choirs, radio programs and school and university programs. The result was that only 7% of all the music they used was from Argentina and in that number was included the National Anthem. On the 40th anniversary of the Italian Republic a concert was performed in Argentina with Italian composers. Three weeks after, there was a concert offered to celebrate the Argentinian National Independence Day, and the concert included music by Italian and German composers and only the Argentine National Anthem. Fortunately, things are changing now and Argentinian music is, little by little, being performed more often. Many musicians are doing great arrangements of Argentinian music for choirs, and rock bands are including traditional instruments; there are radio stations specializing in tango, folk music and national rock. There are also publishers starting to publish all this material by national composers. I watch with joy and hope as new conductors energetically approach their own music. Now, it is normal in choral concerts to have more than half of the program with Argentinian composers. Democracy achieves miracles!